-Baby wearing: How to “wear” your baby in a sling or a wrap to foster a closer bond with your child—it’s possible even for mamas with bad backs (and with big babies)! -Breastfeeding: Learn how to listen to your baby’s cues rather than sticking to a rigid schedule—and why people on airplanes love a nursing mother! -Gentle discipline: How to get your child to behave without yelling, threats, or time-outs—it really is possible. -Co-sleeping: How to avoid “sleep training” and get a great night’s sleep for the whole family. Mayim Bialik, Ph.D., is perhaps best known for her lead role as Blossom Russo in the 1990s television sitcom Blossom, and she currently appears on the top-rated comedy The Big Bang Theory. Bialik earned a B.S. from UCLA in 2000 in neuroscience and Hebrew and Jewish studies, and a Ph.D. in neuroscience from UCLA in 2007. She designed a neuroscience curriculum for homeschoolers in Southern California, where she also teaches middle and high school students. 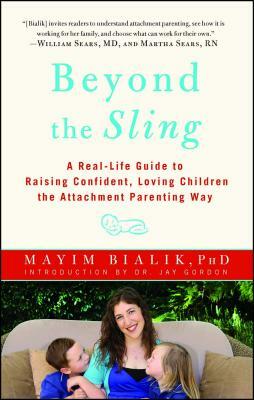 Married to her college sweetheart with two young sons, Bialik is also a Certified Lactation Education Counselor. Visit her at MayimBialik.net. “Drawing on her education as a neuroscientist, her instinct as a mother, and a community of support, Mayim has passionately embraced attachment parenting principles for raising her children. In Beyond the Sling, she shows how the secure attachment relationship that she has developed with her children has given her the confidence to define her own natural parenting style."